My name is Jim Bradac, and I am the inventor of the Kitty Tube™. Along with my wife Jenifer, and our ten beautiful children, we run Kitty Tube™ LLC as a family business in Hudson WI. This is the story of how the Kitty Tube™ came to be. In the fall of 2009, a few of my children came to me with a concern. 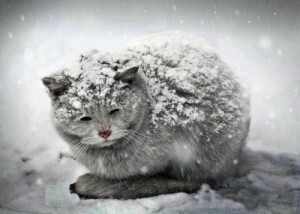 They said, “Dad, because Mom is so allergic to cats inside the house, we need someplace warm so they can stay outside”. Well, I looked at the store and found nothing for an insulated cat house. So, being an inventor already, I decided to retrofit my existing invention, The Ceme-Tube, to become an outdoor shelter for our family cats. I took a 24” Ceme-Tube, cut it shorter, routered an entrance hole for the cat, and made nice hand holes in the lid to serve as both handles and ventilation. I placed a round pet pillow inside, and immediately the cats took to it as their new home. In fact, they rarely came out!!! I spent the rest of 2009 into 2010 refining my design, adding a custom insulation assembly, and by September, I had a model fit for the consumer. After placing the Kitty Tube™ on Amazon.com, it became an immediate hit. In fact, by Christmas we became one of the top 100 new companies on Amazon. It was sold for only three months, as we then discontinued the original model to provide a new and greatly improved model for 2011. After many needed refinements noted by customers on our original model, the New and improved Kitty Tube™ was released in Oct. of 2011, and quickly became the best selling cat house on Amazon. In the first three months, we already had 185+ 5 star reviews on both product and company. We now boast well over 800 5 star reviews and are the NUMBER 1 seller of Cat houses on Amazon. GENERATION 2! In Sept. of 2015, we excitedly released the all new Kitty Tube GENERATION 2. We listened to our customers, and addressed any and all issues customers may have had in using the Kitty Tube in real life experiences. We made improvements and added features that will clearly separate the Kitty Tube from all other cat houses available today. Also in 2015, we moved from our humble beginnings, into a new, larger, and greatly improved corporate headquarters in Hudson, WI. I am proud to offer a “GREEN” product that is MADE IN THE USA, and I am very proud that our entire family helps to run this awesome company. In 2016, we launched the Generation 3 Kitty Tube. Generation 3 upgrades included a new awning design and a vent cap on the lid to increase airflow. The Kitty Tube™ is completely made in the USA, and the shell is molded from post consumer content consisting of recycled milk and detergent bottles. By purchasing a Kitty Tube™ you are not only supporting our family, but many more families in the USA that provide materials and services in the manufacturing of the best insulated cat house on the market – The Kitty Tube™. Sincerely, Jim Bradac – Inventor of The Kitty Tube.